This guest blog was written by Don Stark, an Aquarium volunteer, avid scuba diver and frequent Bahamas Collecting Expedition trip participant. Stay tuned for more posts and pictures from expedition participants and staff diver Chris. This is because, lacking any natural predators and with voracious appetites and impressive reproductive skills, lionfish could become the most abundant fish species on coral reefs, displacing many other species that contribute to the health of coral reefs. Recently, efforts to manage this invasion have taken the form of creating a fishery for lionfish and a demand from the fish eating public. The good news is they are great to eat. [Check out this previous post about sampling lionfish here!] 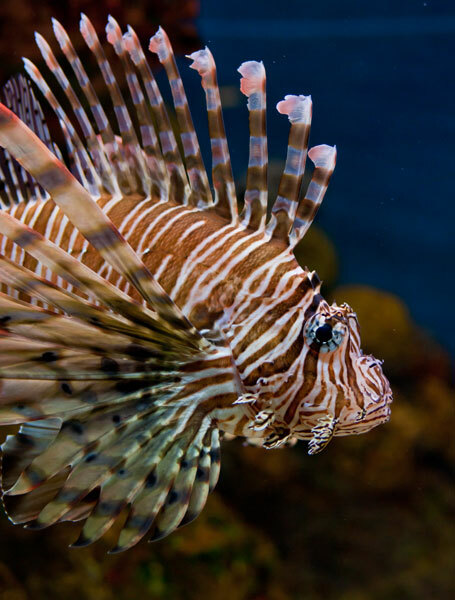 Dining on them can be one way to deal with lionfish, as long as consumers don't develop such a taste for them that they want to keep lionfish around just to eat them. At the end of the day, it will take the hard work of everyone--scientists, conservationists, fishermen and chefs, to help eradicate lionfish from areas where they don't belong. How timely. I was just searching the web trying to find a local source to try lionfish in the Boston area. Any ideas on where to find it locally? Thanks. I believe Bun Lai is doing invasive species dinners at Miya's Sushi in New Haven. Maybe an opportunity to get him involved in a guest chef dinner using invasive species? I too have been looking for a place to buy lionfish meat in Boston with no success. Would love to hear if anyone else knows. With each female lionfish capable of laying 300,000 eggs a season, lionfish are ravaging Bermuda reefs. 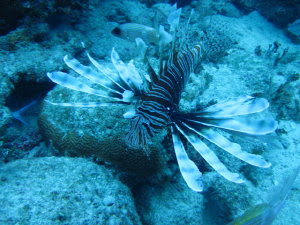 Bermudians will gladly take scuba divers with spear guns "fishing" for lionfish. Let the hunts begin. Bahamas Expedition: Diving in the dark!